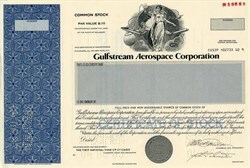 Beautiful engraved RARE specimen certificate from the Gulfstream Aerospace Corporation dated in 1983. 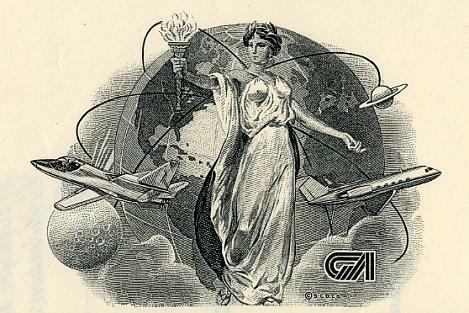 This historic document was printed by United States Banknote Company and has an ornate border around it with a vignette of an allegorical woman holding a torch with airplanes flying around a world globe. This item has the printed signatures of the Company's President and Secretary and is over 30 years old. This it the first time we have had this certificate for sale and we only have one. Gulfstream Aerospace Corporation is located in Savannah, Georgia, United States, and has been a unit of General Dynamics since 2001. The first aircraft named Gulfstream was the twin-turboprop Grumman Gulfstream I. The success of this program lead to development of the bizjet Grumman Gulfstream II. In 1978, Grumman sold Gulfstream to Allen E. Paulson's American Jet Industries, renaming the company Grumman American. The purchase of Rockwell's Aero Commander program completed the formation of the new Gulfstream Aerospace. In 1985, Chrysler acquired Gulfstream with Paulson remaining in charge but a few years later Paulson teamed up with Ted Forstmann and his associates to buy the company back. In 1999, General Dynamics acquired Gulfstream from Forstmann Little and, in 2001, added Galaxy Aerospace from Israeli Aircraft Industries (IAI). Their production lines, located in Israel, are used to co-produce the G100/G150 and G200 with IAI. The G100/G150 and G200 were formerly sold independently by Galaxy. History from Wikipedia and OldCompanyResearch.com.